If you are truly passionate about fashion then you will definitely be eager to dress within the trends while going to the job. And if we’re talking about a company which has a certain dress-code then your creativity and inspiration has to be really high. If the company you’re working for has certain rules when it comes to dress code you should follow them so your freedom regarding your day by day outfit will be limited too. Therefore you should start your own business. Well no, I’m just kidding, cherish your job but try to follow the trends too. When we’re talking about the rules that companies are having regarding the dress code, we’re referring to: colors, shoes that cover the toes, the length of the skirt and no extravagant accessories. 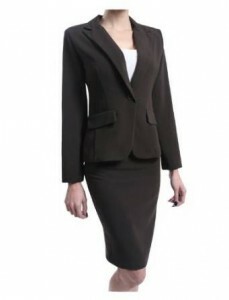 –	The suit quality – it doesn’t matter if we’re talking about jacket and pants or jacket and skirt. Well, yes, business suit can become an investment so don’t pay too much attention to its price if you find a well fitted one. It will fully worth the money, trust me! –	Even if you have limited colors to work with, buy one shirt from each approved color so you won’t get bored day by day wearing a white shirt under the jacket. –	Don’t throw away all your accessories. Yes, it is true, the extravagant ones you won’t be able to wear at your job but you can use them with other occasions. Also, the more stylish and delicate ones are OK to wear even at the job. –	You shouldn’t neglect wearing a perfume so choose a stylish one and you’ll definitely feel better. And why not, your colleagues too!